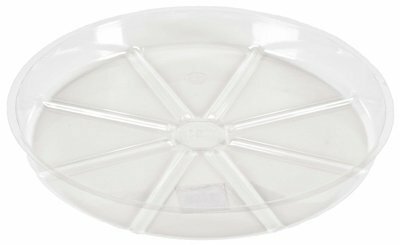 (300) ea Woodstream VS8 8" Clear Vinyl / Plastic Plant Saucers Gardener's Blue Ribbon® vinyl saucers are great for potted plants. These clear vinyl saucers easily catch excess water, prevent surface stains and protect carpets, floors, and furniture. Interior ridges keeps planter bottom out of water - keeps plant roots healthy and provides for better plant health. The clear color of these vinyl saucers mixes and matches with all ceramic, clay, and plastic planters/pots. They're made of 100% recyclable plastic, yet they are strong and waterproof! Will help protect your floors and furniture from those harmful water stains and rings plants often leave. If you have any questions about this product by Gardener's Blue Ribbon, contact us by completing and submitting the form below. If you are looking for a specif part number, please include it with your message.